Wonder Woman #32 Review – AiPT! Wonder Woman must find out who is targeting Zeus’ children before their sights are set on her! James Robinson launched his run on Wonder Woman with an elaborate prologue issue two weeks ago. This week, “Children of the Gods” Part Two dives deeper into Grail’s quest to use the power from the old gods to quicken her father Darkseid’s growth. We also finally learn about that long-lost brother DC Comics was so excited about. Wonder Woman must find out who is targeting Zeus’ children before their sights are set on her! What kind of monster has the power to murder a demigod?! The first part of “Children of the Gods” didn’t have much action from Wonder Woman herself, but this issue makes up for it with an opening that feels ripped right out of the Wonder Woman movie. After the Wonder Woman: Steve Trevor one-shot introduced them to the comics universe, we finally see the “Oddfellows” characters from the movie in the main WW book. In the opening scenes, we find Steve, his friends and Diana fighting Parademons in Paris, after A.R.G.U.S. noticed a Apokolips-linked energy signatures there. This all has to do with the mystery surrounding Hercules’ death. As readers, we all know what’s going on here and Wonder Woman herself figures it out very quickly. The second half of the book has a very different tone. 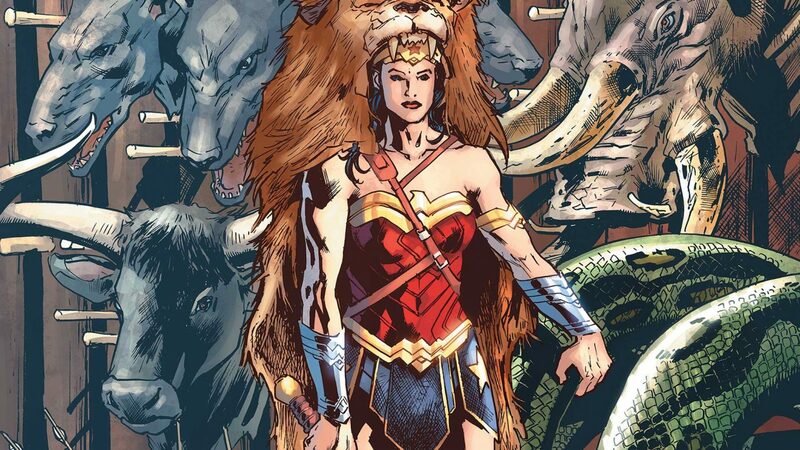 Wonder Woman meets up with the lawyer about Hercules’ will and this leads to the discovery of her brother. I won’t say who it is, but it helps if you know your Greek mythology. If Robinson didn’t deliver enough Wonder Woman action in his prologue to “Children of the Gods,” this issue features an overload of it. And that’s not a bad thing at all. It’s great to see a healthy balance of Diana using her powers and how inspiring she can be when she’s not. There’s a great scene towards the end where we see two young girls rushing to wave to Wonder Woman, and she waves back. As for the art, Sergio Davila (Conan the Slayer) replaces Carlo Pagulayan. While the art is good, the lack of consistency on Wonder Woman has been disappointing. Clearly, doing two issues a month is a problem for whoever is considered for the book, making me wonder if WW should become a monthly. During Greg Rucka’s run, DC got around this by having two different stories going with an artist working consistently on each. Davila’s work is dynamic and energetic, and his style isn’t too far off from Pagulayan’s so the jump isn’t as jarring as the leap from Mirka Andolfo to David Messina on “Heart of the Amazon” was at least. So far, the strength of “Children of the Gods” lies in its writing. The train that brings Grail and Wonder Woman together is moving quickly, even if Grail isn’t in part two at all. The accompanying mystery of Diana’s brother also doesn’t feel shoehorned in. We can see that finding him before Grail does will be important. If DC is going to give Wonder Woman a long-lost brother, this is the perfect story to introduce him in. After last issue focused on setting up the villain, Robinson turns attention to Wonder Woman, who is on every page of this book. Once again, there's an artist switch. Sergio Davila's art is fantastic, but it would've been great to see Carlo Pagulayan draw this entire arc.